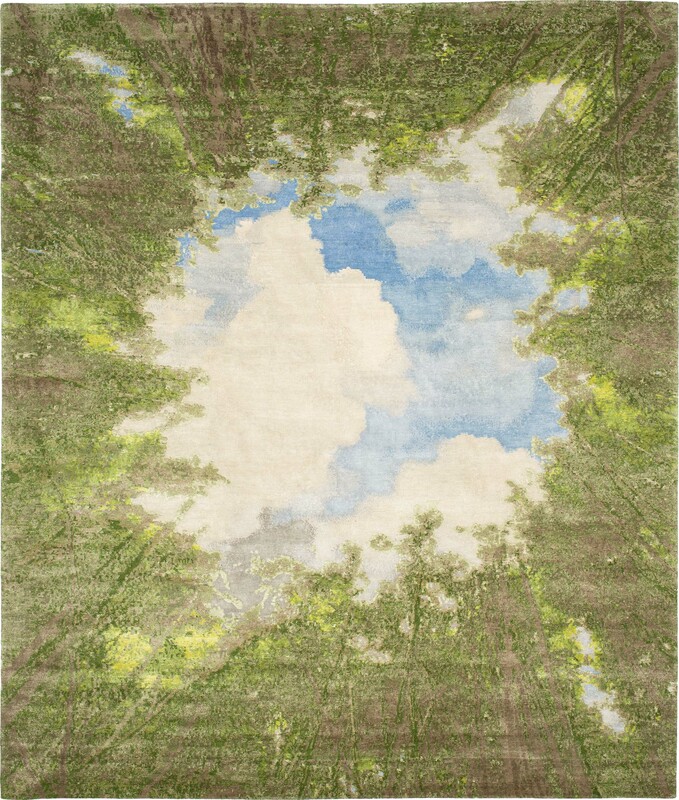 ‘Magic View’ from the ‘Jungle’ collection by Jan Kath as illustrated via rendering/visualization. | Image courtesy of Jan Kath. As clear as the skies are not in ‘Cloud’ from Jan Kath’s ‘Heiter bis Wolkig’ collection, I vividly recall first seeing the collection in January of 2016 during ‘A Family Affair’ with my colleague and fellow magazine Editor Lucy Upward of COVER. She immediately appreciated the collection whereas I was less receptive; this perhaps owing to my love/hate relationship with photorealism in rugs and carpets. Nonetheless, as years have gone by I’ve come to appreciate the collection becoming quite fond of later carpets in the grouping particularly the more storm inspired versions not shown here. The original ‘Magic View’ had already attempted to convey this duality of perspective, choosing to present the viewpoint most accessible to humanity, of man gazing upward. And while one cannot find technical fault in ‘Magic View’ I have – until now – been left to imagine what a human, man, woman, or otherwise could possibly be contemplating as they gazed skyward into a banal sea of beige. Hopefully they were imagining a better place (or carpet), one free of this dense and oppressive smog-like hue. Kath now fulfils this exciting promise and with ‘Magic View II’ not only delivers the wistful skyward viewer from hues unbecoming, but also finds the precise balance between photorealism and the art of carpetry. ‘Magic View II’ from the ‘Jungle’ collection by Jan Kath as illustrated via rendering/visualization. | Image courtesy of Jan Kath. Given the history of design development at Jan Kath the introduction of ‘Magic View II’ was not unforeseeable, yet it still manages to surprise and delight. 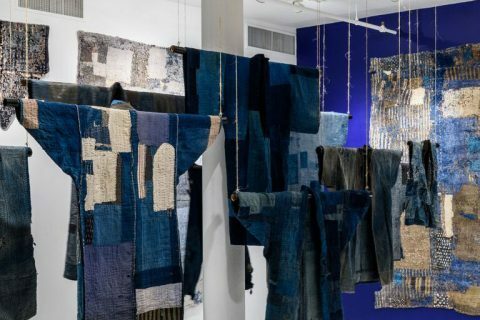 The palette is true to form pairing cerulean and citrine in a manner reflective of the natural environment and both the sky and the forest perfectly convey the essence – the promise Kath referenced – of unknowns. Metaphorically ‘Magic View II’ removes the beige ennui and in its stead leaves a feeling of hope; a vernal expression of rebirth. 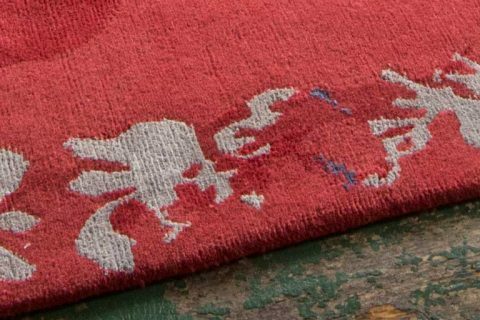 For those more familiar, there is also a degree of symbolism in which ‘Magic View’ and ‘Magic View II’ represent the extremes present in the skies above Kathmandu where these carpets are made. 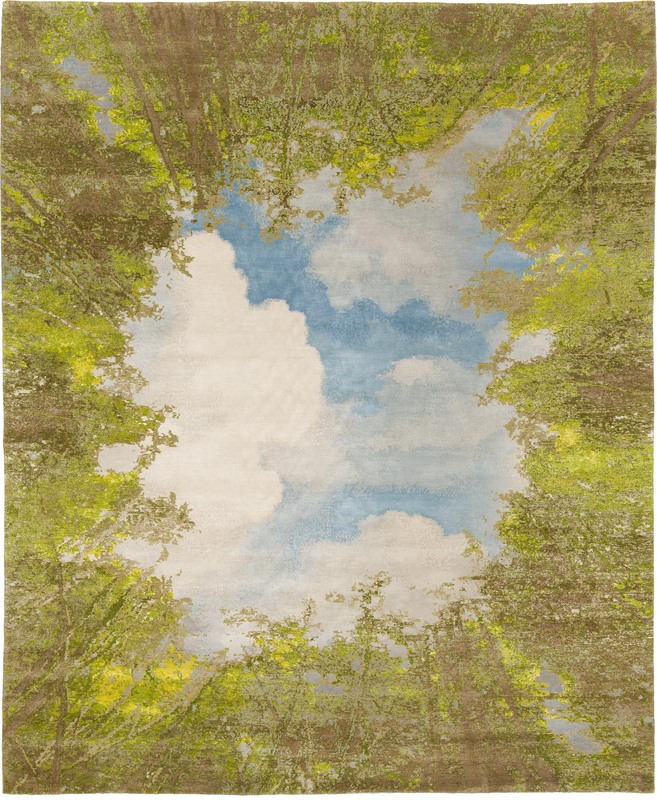 ‘Magic View II’ from the ‘Jungle’ collection by Jan Kath as illustrated via photography of an extant 8’0″ x 10’0″ (250cm x 300cm) carpet. | Image courtesy of Jan Kath. 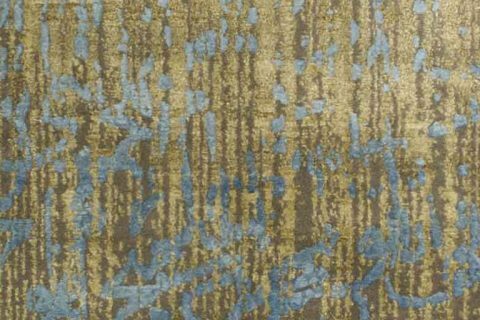 ‘Magic View II’ – like many other carpets from Kath including his award winning Spacecrafted – is knotted with a taller pile height, giving the carpets an opulent feel. I once asked Kath why he made Spacecrafted so relatively thick compared to other Nepali made carpets of similar knot count. He replied with some technical details he asked me not to share, but then concluded by saying: ‘I also just really like thick lush carpets underfoot.’ Logical or not, it is all but impossible to argue against what feels nice. Amiright? The original version of this article was published on 13 April 2018 shortly after I had taken note of an image of ‘Magic View II’ on the Facebook page of Jan Kath. In my zeal and appreciation of said carpet I failed to exercise a proper critical eye in my presentation of the carpet herein. Namely, I failed to ask if the supplied image was a rendering/visualization of the carpet or a genuine photograph. Moreover, I failed to realize – as should have been and is apparent upon close examination – the images were precisely that. They are now noted as such. There is a degree of irony associated with this error and it quite perfectly summarizes my feelings toward photorealism in carpets and heightens my love/hate, appreciation/disdain for the presentation of carpets via rendering/visualization. ‘What is real and what isn’t?’ and more importantly, ‘How much artifice and trickery – well intentioned, nefarious, or otherwise – in our lives are we willing to accept?’ Transparency is all that is required and I present that here today. 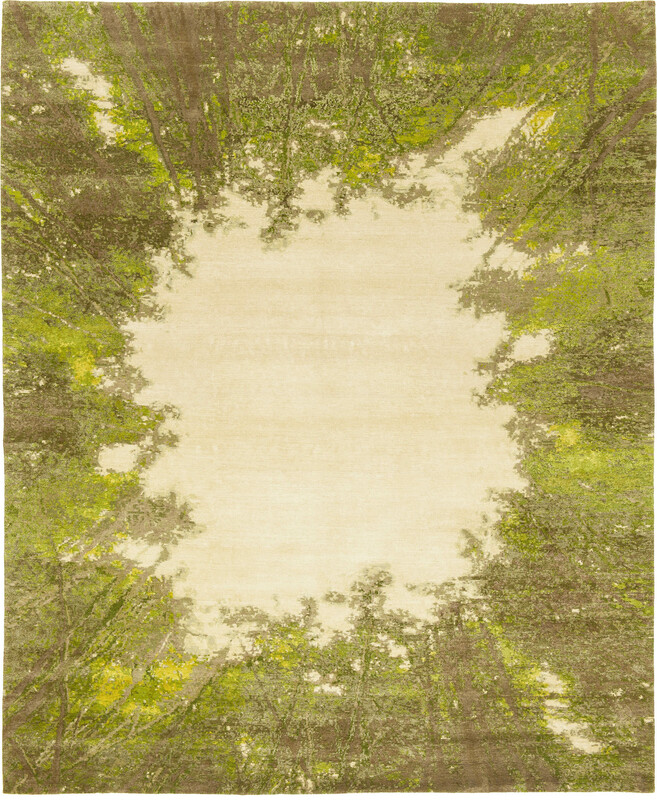 As one can readily note in the images presented above, ‘Magic View’ and ‘Magic View II’ as presented in the original article clearly have identical pattering in the treed border; they also exhibit veritably identical highlighting and colour – a near impossibility with actual photography of extant carpets. Layered upon one another in Adobe Photoshop the images only further illustrate this for those yet convinced. Contrasted with the genuine photograph of ‘Magic View II’ (shown above far right), it doesn’t require a trained eye to see the differences, though for those with extensive carpet viewing experience the differentiations are more pronounced. These differences undoubtably came about via subsequent revisions to the design which took place between April 2018 and when the carpet was débuted at ‘A Family Affair’ in January 2019. On the other hand – when working with a less fastidious firm, one less experienced, lower cost, or less reputable, one completely dissimilar to Jan Kath – the differences between rendering and realization may be accidental and unintentional, perhaps gingerly described as ‘translation artifacts between design and production.’ From a consumer perspective this has the potential to be disappointing to say the least. 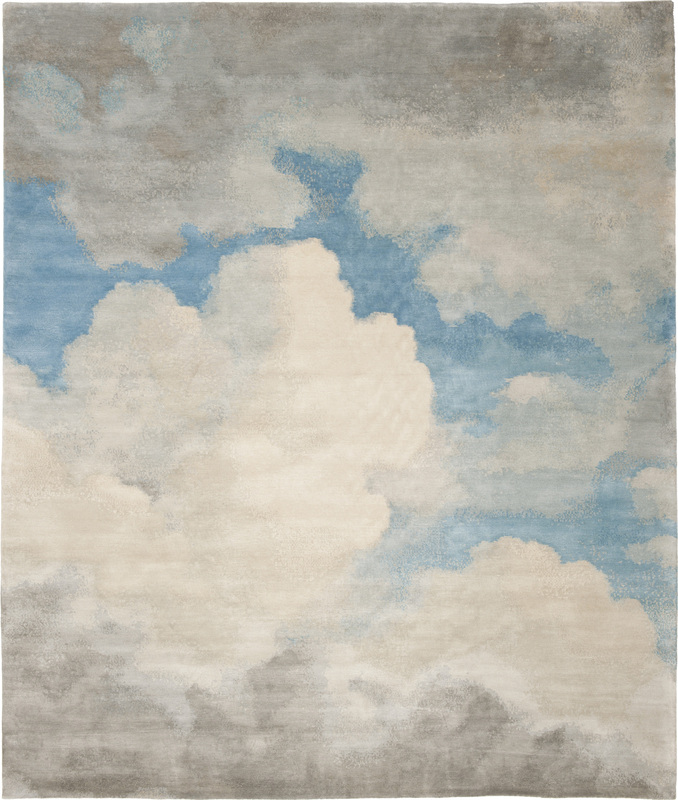 In this instance and based on my own experience ordering a custom carpet from the firm of Jan Kath I know a rendering/visualization from the firm accurately portrays the finished rug, yet what is the average consumer to do when sourcing a rug or carpet? The same as I should have known to do: Ask many, many, many, questions. All of this monotony of integrity notwithstanding, I still love the carpet! Regardless of merit, technical, artistic, or otherwise I must admit a personal bias toward the inviting naturally inspired palette of ‘Magic View II’. For you see, at one point I fancied myself a rug designer and during the exploratory phase of my former endeavour known as Red Spruce I commissioned what was the very first sample of that firm’s Canadian made studio quality hooked rugs. ‘Mandala’ was created from the firm’s logo and while simplified to a two colour palette, is coloured not dissimilarly to Kath’s ‘Magic View II’. The difference of course is that Jan Kath is a couturier of carpets and I, well let us just say that perhaps I better embody the sentiment expressed in the Woody Allen film ‘Annie Hall’: ‘Those who can’t do, teach… .’ All levity aside, there is a pronounced distinction between idea and execution and the firm of Jan Kath has consistently proven itself capable of delivering both. 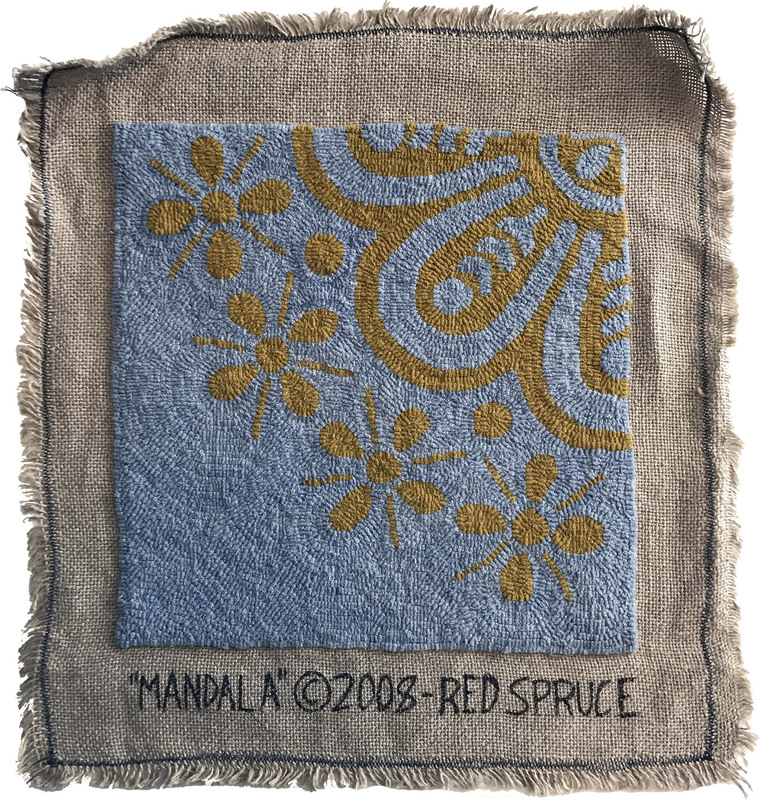 ‘Mandala’ sample shown in the studio quality by Red Spruce. | Image: The Ruggist file.